DMM carabiners are top-quality work carabiners designed and manufactured in the U.K. From the the robust steel carabiners to the clever Revolver with built-in pulley, you will be impressed by the design, quality and function of these work carabiners. You can rely on your DMM carabiner for top performance, whether it is part of your tree climbing system, tree rigging system, or even just an accessory carabiner on your harness DMM products are made with pride in Wales. The PerfectO range uses a new extra short gate to make the profile as compact as possible, minimising eye-to-eye length whilst maintaining usability and easy one-handed use. The true oval shape provides effective centring of loads and the fully rounded rope bearing areas increase carabiner and rope longevity. Its keylock nose allows snag-free operation. The straight gate version is ideally suited for racking gear and the colour options help to quickly differentiate between equipment. This is the smallest Locksafe gated carabiner that DMM makes and is 15mm shorter than an Ultra O yet still retains a strong construction. Available in standard and removable captive bar versions. This Double-Locking carabiner from DMM is lightweight, high-performance, strong, and versatile. Innovative construction keeps this carabiner light and easy to use even when wearing gloves. Also available in a 3-Color Pack great for training or visually identifying different purposes. DMM's Ultra-O Locksafe Carabiner could easily be described as the perfect aid climbing carabiner. The I-Beam construction makes this carabiner lightweight and strong, and the symmetrical oval shape keeps carabiners from shifting under load. Ideal for pulley systems and aid climbing. The DMM Ceros carabiner helps align loads in the correct orientation with a removable, tamper-resistant captive bar. This holds the Ceros captive on a harness or lanyard. A 'horn' on the top of the carabiner prevents devices moving onto the connector’s spine. This carabiner has the great manufacturing, strength, and smoother operation you expect in DMM carabiners, with an added 'horn' to help keep the carabiner from becoming cross-loaded. New lock option on one of the most popular DMM carabiners, the Ultra-O. This oval carabiner is ideal for doubled rope tree climbing, as the symmetrical shape keeps your Hitch-Climber setup stacked neatly and compactly. The Durolock (Dual Rotor Lock) was designed to minimize the chances of accidental gate opening, and maximize levels of security. Its complex, yet easy to manipulate gate requires four distinct actions to open, and once released auto locks back to safe. It is perfect for complex/busy rigging applications. The Sentinel carabiner has a kink in the spine which helps to keep it properly positioned and allows for a wider gate opening. The DMM Aero HMS Locksafe carabiner boasts a great resistance to wear and excellent heat dissipation. Features an anti-snag keylock nose, deep gate bend for easy rope clipping, and a generous 11.3mm rope radius capacity. New version of this popular Double-Locking carabiner. The Revolver is a popular carabiner with a built-in pulley to reduce rope drag by up to 40%. This is a great carabiner for redirects, rescue, and haul systems. The Revolver Rigs bring industrial strength and performance DMM's awesome Revolver carabiner with pulley! This carabiner can be used in any running rope system to increase efficiency. The Revolver Rig comes into its own when flexibility and efficiency are paramount, it excels in improvised rescues, compact mechanical advantage systems and reducing friction in rigging featuring ropes. The twin sheave version allows compact mechanical advantage systems to be created with the minimum of equipment. The Revolver Rig Twins bring industrial strength and performance DMM's awesome Revolver carabiner with pulley! This carabiner can be used in any running rope system to increase efficiency. The Revolver Rig Twin comes into its own when flexibility and efficiency are paramount, it excels in improvised rescues, compact mechanical advantage systems and reducing friction in rigging featuring ropes. High-strength Double-Locking steel carabiner is zinc-plated to resist corrosion and weathering. Popular carabiner. HMS steel carabiner is high-strength and zinc-plated to resist rust & corrosion. High-strength, captive eye carabiner with zinc-plating to resist rust and corrosion. This is a great aluminum screw-locking carabiner that has been made super-light without sacrificing top-notch strength and handling. The Phantom is lightweight, with strong I-Beam construction, compact size, and great price. The Vault is a secure and durable tool holder that can be used on everything from harnesses and kit bags to vehicles. The two part aluminum alloy Vault is secured using a stainless steel bolt and is the ideal solution for gear storage, organization and transportation. The locking gate option provides even greater security for your kit by preventing accidental opening, and can be set in locked or unlocked positions. The PerfectO range uses a new extra short gate to make the profile as compact as possible, minimising eye-to-eye length whilst maintaining usability and easy one-handed use. The true oval shape provides effective centring of loads and the fully rounded rope bearing areas increase carabiner and rope longevity. Its keylock nose allows snag-free operation. The straight gate version is ideally suited for racking gear and the colour options help to quickly differentiate between equipment. Sold individually. This tiny (and we mean tiny!) accessory carabiner from DMM is surprisingly strong thanks to it's hot-forged I-Beam body. The key lock nose and regular gate mean less snagging vs a wire-gate carabiner. This tiny oval has tons of uses as an accessory biner. All of the strength and great design you've come to expect from DMM in a tiny package. Sold individually. This carabiner is not rated for supporting a climber! This mighty little carabiner from DMM has certainly earned it's name of 'Thor' with an impressive 28 kN breaking strength, an 11 kN strength with the gate open. Smooth action, strong, I-beam body, and big one-inch gate opening make this carabiner a popular choice. Medium-sized non-locker with a captive eye great for webbing and a bent gate for easy clipping-in. Linkits are the missing link in lightweight compact rigging. Based around a 'boss and yoke' concept, this line of connecting components is compatible with a range of existing DMM products. These CE compliant elements open up a world of creative rigging options with the added advantage of making 'silent and invisible' systems possible. The Wallis is a polymer corner trap that reduces the possibility of any cross loading scenarios between a webbing sling and a carabiner. Quick and simple to install yet invaluable in maintaining safer configurations. The Grommet is a polymer insert designed to fit in devices and provide a flexible friction interface between the device and a connector. This minimizes the any movement and so optimizes the configuration. The Grommet fits perfectly in any of the 16mm attachment holes of the DMM Triple Attachment/Hitch Climber pulley. 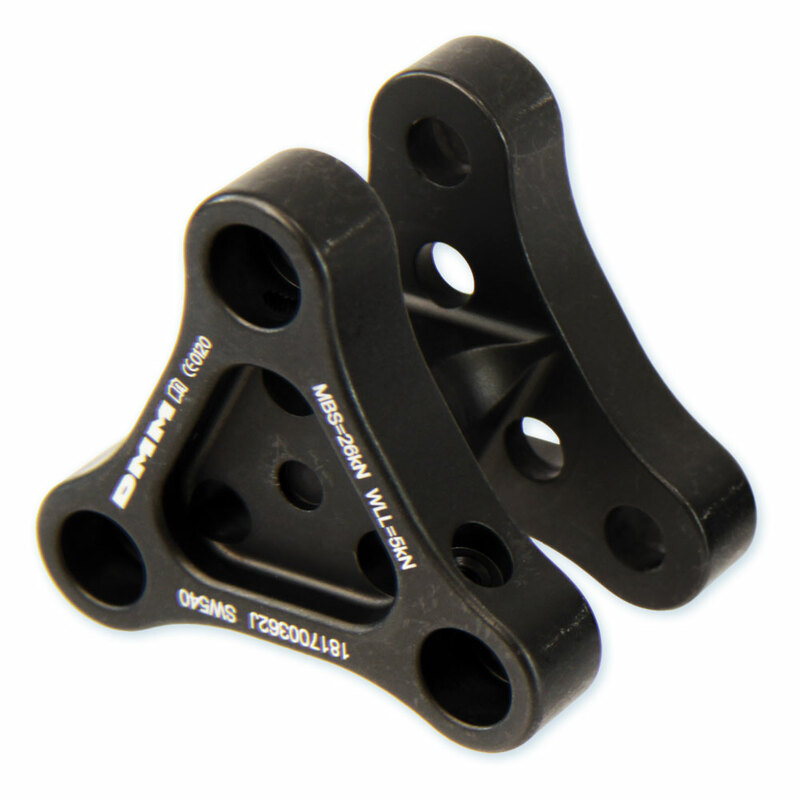 The Prest-in is a polymer insert designed for use with the Compact Swivel range and provides a flexible friction interface between the Compact Swivel and a connector. This minimizes any movement and so optimizes the configuration.